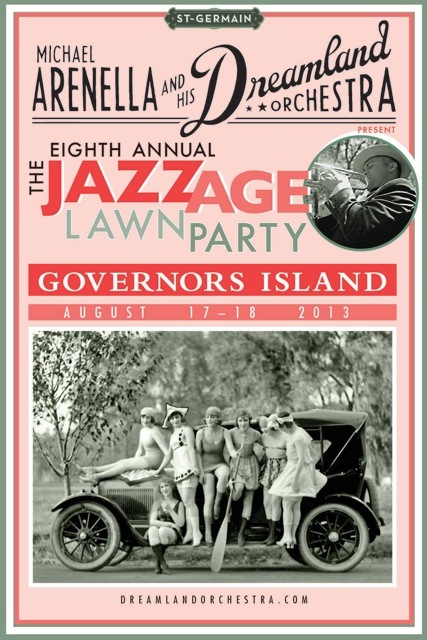 [caption id="" align="alignleft" width="256"] The 8th Annual Jazz Age Lawn Party! [/caption] Two weekends a year, guests from all over come to Governor's Island for a fantastic, fun filled day of time traveling. This is the chance of a lifetime, an exciting opportunity where one can fully discover and experience one of the most colorful and creative decades in America's historic past. The Jazz Age Lawn Party is an original New York City prohibition era style gathering that has been held for 8 years with no foreseen plans of stopping. From the decade that brought you flappers and a lifestyle best suited for Jay Gatsby, this annual event is not to be missed. Michael Arenella, the originator and host of the grand party himself, started off this affair as a small gathering of a few friends and fans (around fifty or so). It was initially produced by the island itself but was handed over to Michael upon it's third year running. Under his command, the gathering has blossomed into one of the most coveted events of the summer season. Michael is the leader of the Dreamland Orchestra, a well crafted group devoted to traditional music of the 1920s and early 1930s. [caption id="" align="aligncenter" width="432"] Flappers and gents travel back in time at this annual occasion! [/caption] Today the event is well known. The Wall Street Journal calls it the “the biggest (not to mention the cleanest and most family-oriented) regular event in the ‘Retro Noveau’ movement…” while the The New York Times has listed it as "one of the most memorable events of 2011 and 2012". In 2013, the joyous day was held on June 15 and 16 as well as well as it's most recent weekend run on August 17 and 18. The events activities include dance lessons along with a charleston dance contest, a pie contest, and a splendid motorcar exhibition. Guests get the chance to take vintage inspired portraits atop the event's iconic Paper Moon all while listening to authentic music of the time via antique gramophones. But it doesn't end there. 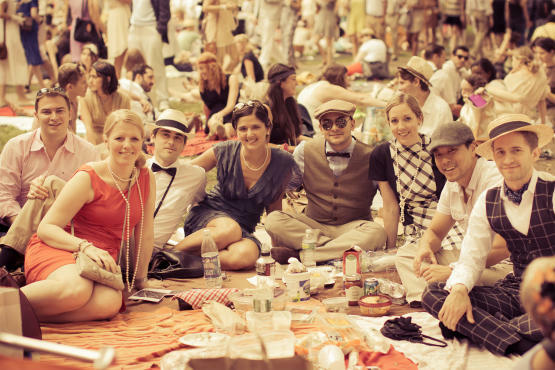 [caption id="" align="aligncenter" width="389"] Guests gather in their 1920's best, picnic style on the lawn. [/caption] While various performers (from Roddy Caravella and the Canarsie Wobbles to the tap dancing Minsky Sisters) entertain, guest line the lawn snacking on food picnic style in their best 1920s garb. What's any classy and respectable fellow to wear to such an occasion? The Roaring Twenties called for an extreme comeback of evening wear. The Great War was over and it was time to celebrate. Tuxedos reigned in the Golden Age triumphantly. Men's formal wear called for bow ties and white waistcoats. A traditional black tuxedo was swapped in for a deep and daring midnight blue tuxedo. Dinner jackets also became acceptable and fashionable to wear over a traditional dress coat. The 1920's proved to be a significant and serious time for formal wear. It continues to inspire individuals even after multiple decades have past. Dare to be different this season and allow the magnificent musings of the era to inspire your next formal wear ensemble.